If it’s Friday, it must be Pizza — and I’ve got fennel on my mind. 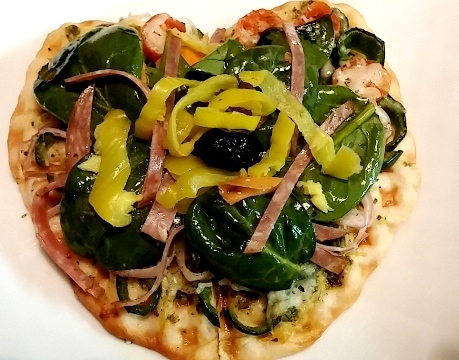 Today’s pizza showcases a tempting combination of flavors and textures that covers all the bases. 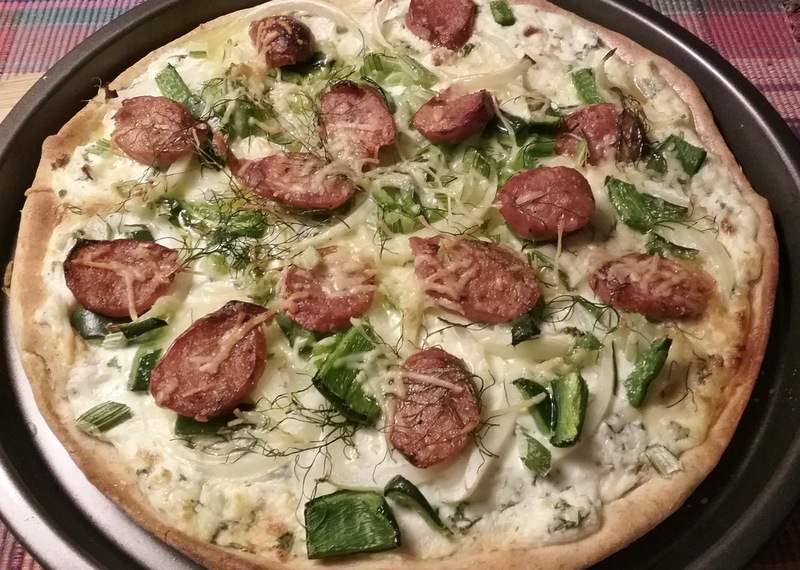 We’ve got creamy ricotta, fabulous fresh anise-scented fennel, slices of spicy sausage, and more. This easy pizza begins with a mild ricotta base designed to complement fennel’s sweet and subtle flavors. Any firm precooked sausage will work, but I’m particularly fond of linguica — or perhaps an Italian or Portuguese style laced with a hit of fennel or anise seed, garlic, and red pepper. 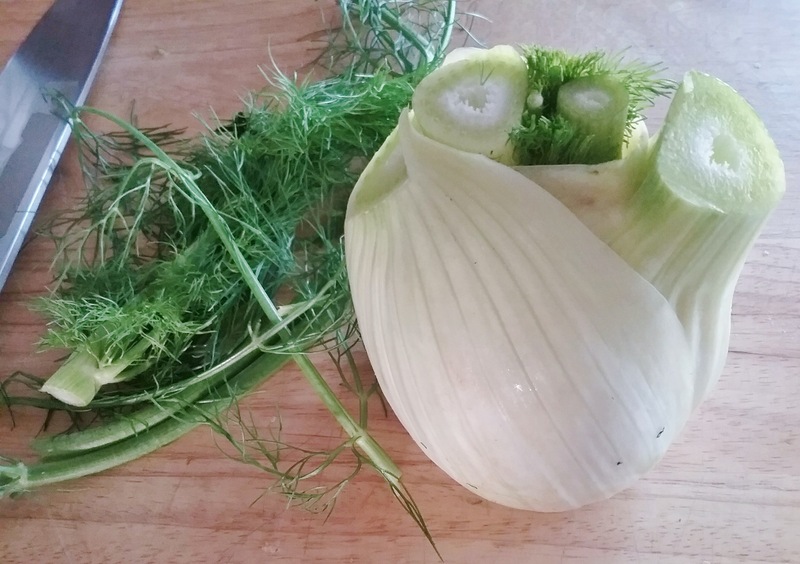 It’s not too late to latch onto fresh fennel before it goes out of season. Its bulb is the most tender and mild part; to easily slice it, first cut the bulb into quarter wedges and remove any lurking hard center core. Save those tougher stalks and shoots for use in soups, stews and other cooking projects. If you are as crazy as I am about fennel’s mild licorice flavor, sprinkle some of the feathery fronds across the pizza before popping it into the oven. Remember to remove your smartly prebaked pizza crust (see here) from the freezer for a quick defrost before launching into pizza mode. If not, have one medium pizza crust ready for topping. It’s that easy and that good! 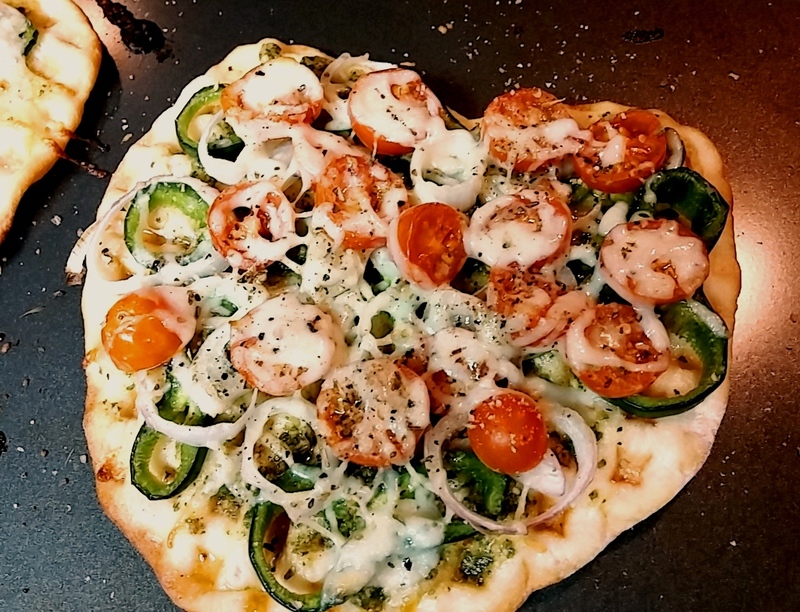 In a medium pizza pan, roll out the pizza dough and prebake, or have prebaked pizza on hand. (see pizza crust). Preheat oven to 375° to 400° F.
Prepare the ricotta filling: if the ricotta is watery, drain it well. Season with Parmesan, garlic, nutmeg, salt and pepper and fold in freshly chopped parsley. This can be done ahead. 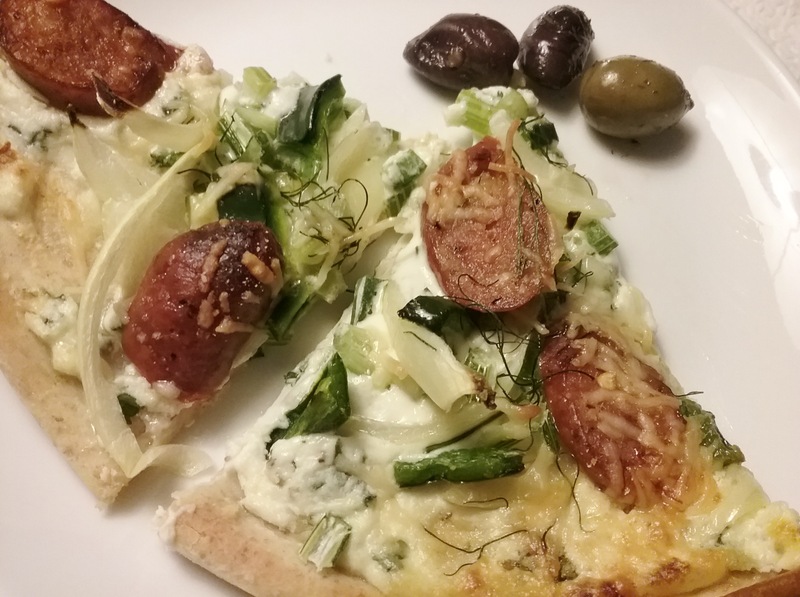 Toppings: thinly slice the onion, fennel, olives and precooked sausage. To assemble: lightly brush the crust with olive oil. Spread the ricotta filling evenly over the crust. Distribute the onion, pepper, fennel and olives over the ricotta and top with the sausage. Season to taste with red pepper flakes, rosemary or oregano, and sprinkle the Parmesan and fresh fennel fronts on top. Drizzle a little olive oil across the top. Bake until the center is bubbly and the crust is browned, 15-20 minutes. Let stand briefly, then slice. Yield: 1 medium pizza. There are times when admittedly, my meals are a little wacky. They can be downright self- indulgent and make little sense to others. Especially on Friday nights. It’s the end of the official work week and it’s time to relax. There are no rules! My refrigerator looks deranged with a mere mishmash of odds and ends and pathetic leftovers. Since I will likely do a grocery shop over the weekend, I resist a stop—and prefer to pass on fast foods. In my experience, there’s always a pizza in the works. Like another stand-by, the taco, a few toppings can become a full meal. To that end, I like to stock at least one pan-size portion of pizza dough in the freezer. It easily defrosts in the microwave and is ready to go in no time. Occasionally, I have even stashed a pre-baked crust in the freezer. It’s a matter of gathering up a few compatible toppings and tucking it all in the oven for a quick bake. That was the situation this past Friday night, between Christmas and New Year’s. Thanks to the holidays, my fridge was ripe pickings for fabulous toppings. No pathetic odds and ends here; I had a little hard Spanish chorizo, a collection of fontina and other cheeses, pasilla peppers, sweet onion, Greek dried olives and — fresh green tomatillos. Whatever. I treated the 8 tomatillos as if they were treasured San Marzano tomatoes. I removed their husks, chopped them up, and made a fast sauce with onion, garlic, jalapeno, oregano. I simmered it briefly, then ran the immersion blender through it until thick and cohesive. The results: a light, bright sauce worthy of this splendid occasion. Turns out, the sparkling sauce brought all of these disparate characters together. The final topping was another gift that kept on giving, too. I had a little cheese mixture left from making stuffed mushrooms earlier in the week: a combination of shredded mozzarella, Parmesan, green onion, garlic, herbs and Panko. These amazing bread crumbs kept the stuffing light, absorbed moisture, and allowed for a beautifully browned top. Who knew it would one day end up on my pizza? It’s another Friday Night Special… and that’s the way it goes. For Tomatillo Sauce: in saucepan over medium heat, add olive oil and sauté the onion until soft. Add the pepper and stir, then the garlic and allow to cook until aromatic. Add the dried herbs, then stir in the chopped tomatillos. Just barely cover with chicken bouillon and allow to simmer until thick, about 7 minutes. With immersion blender, whirl until the sauce is thick, cohesive and still has texture. Prebake pizza crust at 425° in lower 1/3 of oven to set, about 7 minutes. To assemble: cover the crust with a coating of some of the sauce. Top with a layer of green pepper, then the meat selection, the onion, olives, and cheese. Sprinkle with dried oregano and bake another 12 minutes or until browned and bubbly. Cut into portions and serve hot. Serves 2. When using the very best ingredients it’s hard to beat a great combination like fresh mozzarella, vine ripened tomatoes, and basil leaves. Add any other specialty touches like a drizzle of extra virgin olive oil, and you have the makings of a masterpiece. Throw in a fine crispy bread and you will know why Pizza Margarita has long been considered one of the world’s great classics. Last night I experienced such good fortune when I happened to have fabulous fresh bread dough—as well as all the above ingredients. Easily, within ten minutes I was slicing into world class pizza. I had a supply of excellent bread dough on hand thanks to local bread expert Marc Green, who has perfected his own no-knead bread for artisan bread baking. With that in mind, I pulled out a heavy skillet and heated a good drizzle of olive oil. I flattened and patted out a portion of Marc’s dough, threw it into the hot pan, and covered it with a lid to create an impromptu oven. Meanwhile, I gathered up pre-sliced mozzarella, thinly sliced fresh tomato, and plucked a few sprigs of basil off my doorstep plant. When the bottom was crispy, I gave it a flip and added my toppings. It was quickly covered and left to cook for another 3-5 minutes, until the cheese melted and the bottom was golden brown. Since my dough was well constructed and robust, it raised beautifully, much like a Chicago-style pizza. Normally I prefer a thinner crust, but this was so good I nearly polished off the whole thing without stopping for a salad! Given this simple technique, there is no reason why any other bread or ready-made pizza dough would not work. I also sprinkled on red pepper flakes and sea salt but that’s a personal thing. Simply nothing else is required. Not even a phone call or text message. Turn raised, room temperature dough out onto lightly floured surface. Lightly dust with flour and cut into four or more portions and shape into balls. Heat a medium skillet (8” approx. ), heat 1-2 tablespoons oil into bottom until it shimmers. Flatten one ball with hand and press into the diameter of the skillet; carefully slide the dough into pan. Cover with a lid and cook 3 minutes until golden brown on bottom and dough has risen, uncover and carefully flip over. 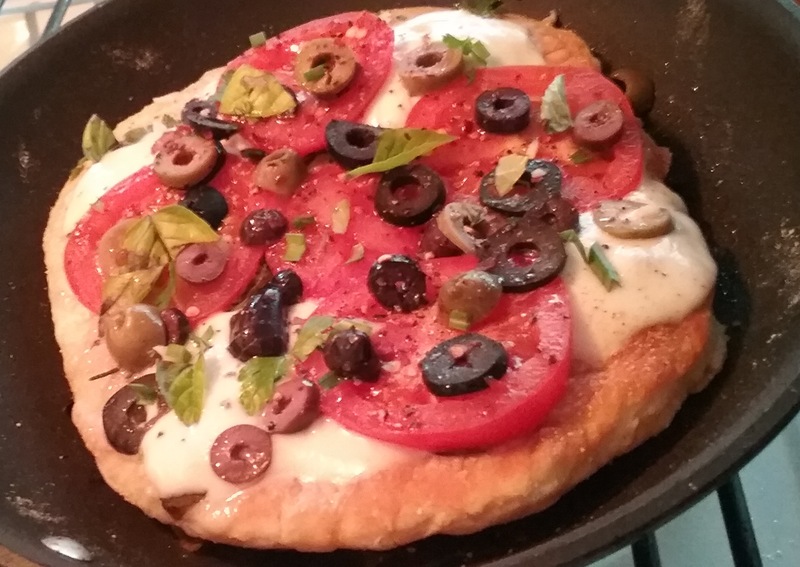 Place the tomato slices, mozzarella slices, and basil leaves on top of the dough. Cover with lid and cook 3-5 minutes longer until cheese is melted and bottom is golden brown. Remove to cutting board, cut into wedges and serve hot. Repeat pizzas as needed. I have a new bag of flax meal that I’ve been tinkering with… it’s my way of boosting my omega-3 fatty acid levels by mixing it into breakfast cereal, smoothies, and such. I’ve learned that a little goes a long way. Flax has a generous amount of fiber that can roar through your system, plowing past anything in its path, so use an amount based on preferential tolerance. Recently I discovered that flax is a natural in pizza crust and other yeast breads. Its inherent nuttiness and pale tobacco color are a perfect complement to a crust enriched with a touch of whole wheat. Used in my current go-to pizza dough, a combination of all-purpose and whole wheat flours laced with flax meal yielded a toasted-yeast flavor and a resilient texture that rolls out like a dream. Even though there a two phases to this dough, the entire rising process still takes only an hour. The first 15-20 minute proofing period activates the yeast with warm water, a bit of sugar, and flour to give the rising process a kick start. This is stirred into the flour/flax mix until a well-blended mass forms, then turned out and kneaded until smooth. It’s covered, placed in a warm spot, and left to rise until double, about 40 minutes. Since I prefer pre-baking my crust to move through the ‘fussing with dough’ phase—and ward off sogginess—I like to punch it down, roll it out as thin as I please, and give it a quick bake to set, 8 to 10 minutes. Then, it’s only a matter of gathering together toppings and baking it all off in a hot oven for 15 or 20 minutes until it’s hot and bubbly. As often with my pizzas, the topping combination is invariably a matter of what I have on hand. On this day, I had a partial bag of mixed greens: kale, broccoli, Brussels sprouts, and cabbage. I envisioned a creamed greens base for my pizza topped with sliced onion, red and pasilla peppers, Kalamata olives and Havarti cheese. For the creamed greens I sautéed onion, slivered garlic, rosemary, and crushed red pepper in olive oil, then added a couple of cups of the shredded greens to the pan and continued to toss and slowly cook until soft and reduced. A slurry of ½ cup milk and 2 teaspoons cornstarch was stirred in along with a dash of nutmeg, salt, and white pepper. As it cooked I added a couple of spoonfuls of grated Parmesan and simmered the creamed greens until thick and tender. All of this was layered onto the crust and baked until bubbly and golden brown. Yes, indeed, an evening with the Tony Awards—and another gourmet delight! In a 2 cup measure or bowl, combine the yeast, sugar, 1/4 cup flour and water; proof in a warm place until bubbly and light, 15-20 minutes. In mixing bowl place 1-1/4 cup flour (see above for combination with flax), and 1 teaspoon salt. Add the yeast mixture and combine well. Turn out onto floured surface and knead until smooth. Cover and let rise in a warm space until doubled, 30-40 minutes. Preheat oven to 400-425° F; oil a pizza pan or baking sheet. Roll dough out on floured board into desired size and shape. To fully bake with toppings: Roll out, add sauce and toppings of choice and bake 15-20 minutes, until center is bubbly and crust is golden brown. Yield: 1 large pizza. Note: To pre-bake for later use: bake 8-10 minutes @ 400-425°, until firm to touch, but not yet colored. Bake as needed in hot oven for about 15 minutes. Here’s a follow-up to my last post… I actually bought a waffle iron. I couldn’t shake the need to further explore the iron’s potential beyond making a waffle. My Black and Decker 3-in-1 has the benefit of non-stick reversible grids which switch from waffle to grill or press―even more applications (or justification). What I discovered is that it works really well for pizza: the little dimples in the crust create tiny crevices for pools of flavor to collect. 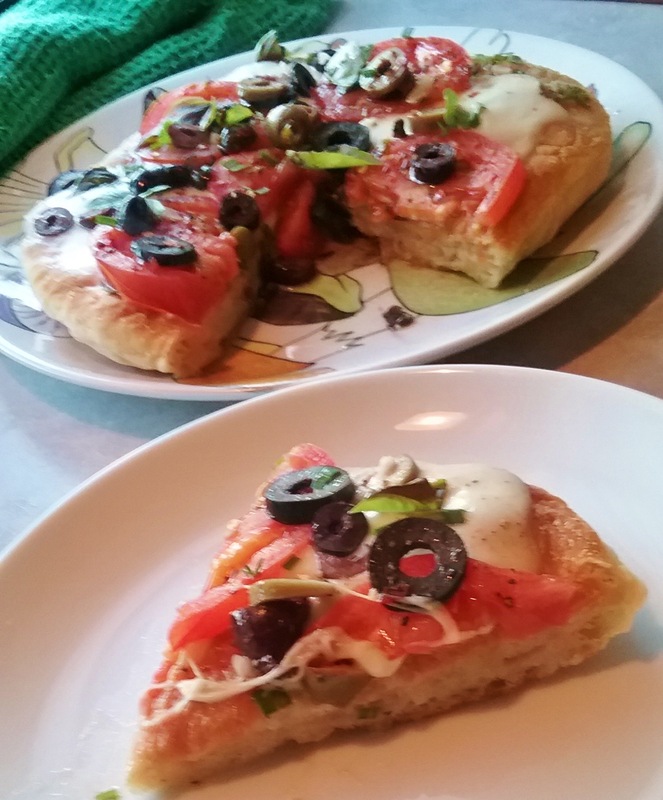 I prefer baking off pizza dough in advance so that it is simply a matter of adding preferred toppings to the crust and popping it in the oven for a quick final bake. There is also the benefit of personal sized pizzas, which make it perfect for parties, appetizers, a quick snack, or dinner. In this case, I made the quick pizza dough I’ve previously mentioned here and let it rise until doubled―it is very malleable and can be rolled as thin as desired. While the waffle iron preheated, I divided the dough into portions: for my iron they were each less than 1 cup in size. I let the rounds set about 5 minutes to further relax the dough for an easier roll-out. This goes so quickly I rolled out and baked one at a time. Mine were about 6 1/2” in size to completely fit into the grill. Once the iron was ready, I gave the grids a good spray with non-stick oil and laid the flat dough onto the grids and closed it. It only took about 5 minutes for the dough to set and take on a slight amount of color; they were then cooled on a wire rack. I did not need to re-spray my non-stick grids again and continued until all the crusts were pre-baked. I stored the cooled crusts in a loosely wrapped plastic bag until needed. When ready to eat, I preheated the oven to 425 degrees and pulled out a baking sheet. By the time the oven was preheated my toppings were prepared. One of my favorite combinations includes pesto sauce instead of the usual pizza tomato sauce. Only a quick light spread across the top is all that is necessary. I added a handful of each of my usuals: sliced onion, slices of poblano or other spicy pepper, sliced baby tomatoes, a good handful of grated mozzarella, and a sprinkling of oregano and red pepper flakes. The prepped pizza goes into the hot oven for a quick bake: about 6 – 7 minutes, until the cheese is melted and bubbly. 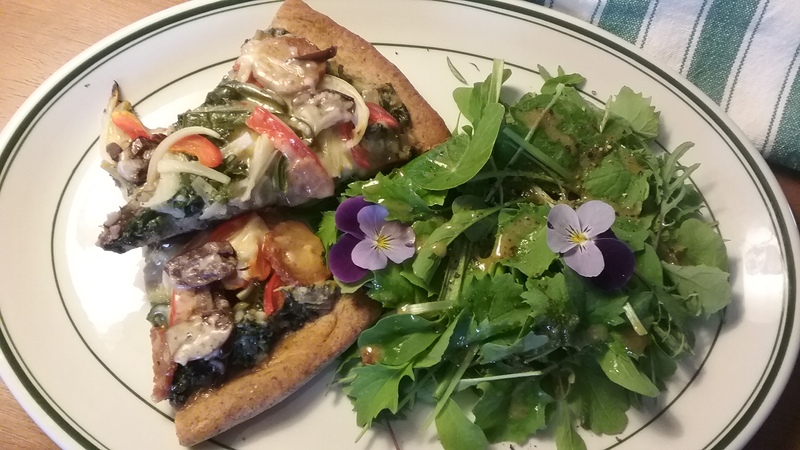 Once out of the oven, I finished my pizza with a final topping of antipasto salad: spinach and arugula, sliced salami, pepperoncini, and black olives, all tossed with a garlicky vinaigrette. Prepare pizza dough. When doubled in bulk, punch down and cut into approx ¾ cup portions. Lightly cover, and let rest about 5 minutes to relax dough. Preheat waffle iron, set to ‘waffles’; it should take 7 to 8 minutes. On a floured surface, roll out one round at a time to fit into the waffle iron, mine were about 6 ½” in diameter. When pre-heated, spray the grids lightly with non-stick spray and lay the rolled dough onto the hot surface. Close the lid and bake until dough is set and lightly colored but not browned, about 5 minutes. When set, remove to a cooling rack and repeat. If making ahead, cool and store light wrapped in plastic bag. To finish pizzas, preheat oven to 425 degrees, have a baking sheet ready. Assemble pizzas according to taste. Set on baking sheet and bake for approximately 6 – 7 minutes or until the crust is browned and the surface is bubbly. Serve hot. Yield: 6 or more pizzas.